Media captionNicola Sturgeon: "What I would like to see now is this issue going back to the people." 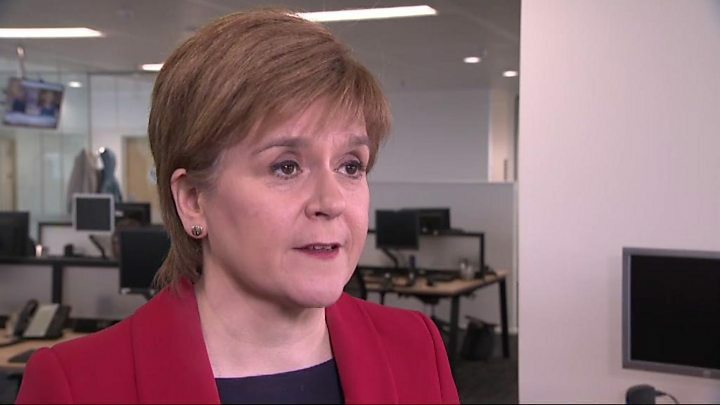 Scotland's first minister has urged the government to "re-set" its approach to Brexit after the latest delay to the UK's departure from the EU. A "flexible" extension of the Brexit deadline until 31 October was agreed at an EU summit on Wednesday night. Nicola Sturgeon wrote to Theresa May to urge the prime minister to "drop your red lines" and seek "genuine consensus" with opposition parties. Holyrood will not be recalled now that the extension has been agreed. Scottish Parliament Presiding Officer Ken Macintosh had warned MSPs they would be required from 13:00 on Thursday if the UK was due to leave the EU without a deal on Friday. However, following the announcement of the extension, Mr Macintosh said a recall was no longer necessary. The six-month extension was agreed after late-night talks in Brussels, and averts the prospect of the UK leaving the EU without a deal on Friday. MPs remain deadlocked on what to do, having repeatedly rejected Mrs May's plan and a range of other alternative suggestions. Ministers are now holding talks with the Labour opposition to see if a compromise can be found. European Council president Donald Tusk said the UK could still sign off the government's negotiated deal, or choose to "cancel Brexit altogether". He added: "This extension is as flexible as I expected, and a little bit shorter than I expected, but it's still enough to find the best possible solution. Please do not waste this time." Mrs May, who had wanted a shorter delay, said the UK would still aim to leave the EU as soon as possible. In a letter to the prime minister, Ms Sturgeon welcomed the outcome of the summit, and said it was "essential that this time is used constructively and not wasted". She said: "We now have the gift of more time from the EU, and that must be used constructively to re-set the UK government approach. Your ongoing talks with the leader of the opposition should now broaden to include other parties, the devolved administrations, business and civic society, and open up the range of options on the table in an effort to reach a genuine consensus. "Fundamentally, the Scottish government considers that any deal agreed by the UK parliament should be put to another referendum, with the alternative proposition on the ballot paper being to remain in the EU. "The extension to 31 October provides enough time to do this, and it is essential that no time is lost in making the necessary preparations." Speaking on BBC radio's Good Morning Scotland programme, Scottish Secretary David Mundell said Mrs May was determined to leave the EU by 30 June. He said: "We're not leaving the EU tomorrow on the basis of no deal. I think everyone, certainly in Scotland, is in agreement that leaving the EU on Friday would not have been a good outcome." Mr Mundell added: "She [Theresa May] wants to deliver Brexit by 22 May so that we don't have to have the European elections and there is still an opportunity to do that. "If we can, as I would hope - because these talks seem to be serious - get some form of agreement with the Labour Party, then it would be possible to ratify the withdrawal agreement by 22 May and leave by then, and it would still be possible also to leave by 30 June." Image caption European Council President Donald Tusk (right) said the extension was "enough to find the best possible solution"
The prime minister had earlier told leaders she wanted to move the UK's exit date from Friday of this week to 30 June, with the option of leaving earlier if her withdrawal agreement was ratified by parliament. Following the extension announcement, she said that although the delay extends until 31 October, the UK can leave before then if MPs pass her withdrawal deal. "I know that there is huge frustration from many people that I had to request this extension," she said. "The UK should have left the EU by now and I sincerely regret the fact that I have not yet been able to persuade parliament to approve a deal." Mrs May added: "I do not pretend the next few weeks will be easy, or there is a simple way to break the deadlock in parliament. But we have a duty as politicians to find a way to fulfil the democratic decision of the referendum, deliver Brexit and move our country forward. "Nothing is more pressing or more vital." The PM said that the UK "will continue to hold full membership rights and obligations [of the EU]" during the delay.